We recently had the opportunity to visit Grace Bay Club in the Turks and Caicos. Located on what is often called the Best Beach in the World, this is the original luxury hotel in Providenciales. Recently have undergone a multimillion dollar renovation is it truly the epitome of elegant luxury. Guests are afforded multiple pools and dining outlets in a serene atmosphere, very close to all the action in the T&C Islands. After being greeted at the airport by a staff member with your name on a sign, you are swiftly taken to a waiting private transfer whisking you away from the hordes of people queuing up to go to the all inclusive Beaches. 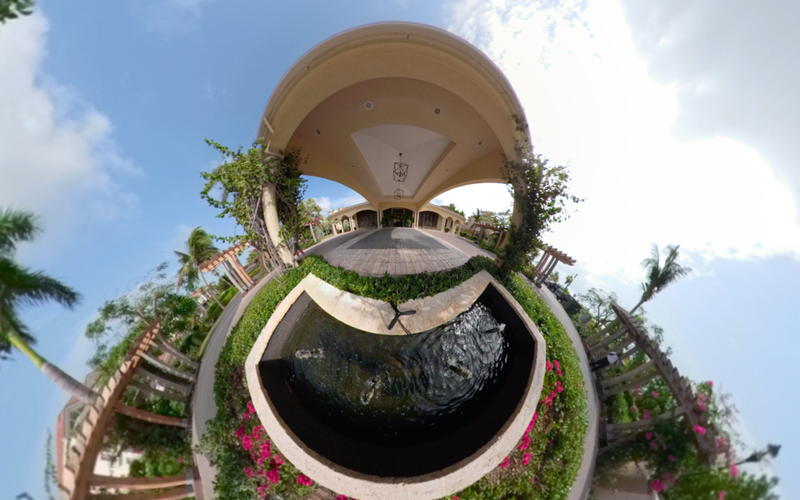 Already feeling relaxed as you approach Grace Bay Club the Porte Corchere is draped in greenery, Bougainvillea, and water features. While your bags are being attended to, check-in procedures begin with a chilled scented towel to refresh from your airport transfer. Soon thereafter you're greeted with a speciality rum punch (non-alcoholic available as well) to enjoy as the necessities are completed. Before we get into the room, let's just take a moment to enjoy the view. Framing the most iconic views in the Turks and Caicos, the very large balcony is attached to both the bedroom and living room,, creating an effortless flow from inside to outside and living to sleeping areas. Oh, and the VIEW! To say the rooms are spacious would be a disservice, these are the largest rooms on Grace Bay. Living rooms feature a sitting area, dining table, mini bar, and wet bar including cappuccino and coffee machines. Space is always a luxury, and this oversized and understated room dwarfs the luxurious King bed. Bedside waters are replenished twice daily and you views of the famous Turks and Caicos blue waters when you wake up are complimentary. Of course, the bathrooms don't disappoint. The adults-only, infinity-edge, ocean-front lap pool blends multiple features into a aquatic oasis. The lap pool provides a refreshing start to the day but couples can still find quiet corners to take a dip close to their lounge chairs. More than once you might see a father/son or group of buddies enjoying a drink at the infinity edge. 🚨Expedition: Bucket List Alert! 🚨 This is the Longest Bar in the Caribbean! Open to families during lunch, this becomes an adults-only chic bar in the evening featuring number of signature cocktails. A slightly more casual place to entertain off the bar with various sitting areas, a fire pit and woven oriental lanterns. The Spa Cabana is visible next to the pool. This is why you come to Grace Bay, and this is why you stay at Grace Bay Club. Voted #1 Beach in the world multiple times the sand is softer and cooler to the touch than you've felt anywhere else. Of course the legendary Grace Bay Club service extends to the lounge chairs. Grace Bay is a BIG Beach of long, clean, cool, sugar-fine sand and calm azure blue water. Sure it gets busier than this but I didn't time this photo but we're not talking Miami Beach here. I've been to beaches in the Seychelles, Fiji, Hawaii, Indonesia, Australia,throughout the Caribbean, this is a really nice beach. The Rum Shop. Personally, I never wanted to leave. Grace Bay Club is the kind of place to come back to time and time again as many do. My photos and videos are taken candidly, nothing is staged (as evidenced by my posture), but this shot exemplifies how well they have bounced back from the storms last year. Even the family pool is photo ready, classic, high design concepts worthy of InstagramTravel.com. Grace Bay Club is a classic and a must when you are in Turks and Caicos. Smart design makes a moderately larger resort feel like a boutique, it appeals to celebrities and a more refined international clientele. Guests range from girls getaways, honeymooners, part time owners, and multi generational families. This isn't the place for a rowdy bachelor party, there other places down the beach for that, but those with an eye for fashion will be very happy here.